We sell in packs of 10 for resale. Choose quantity in drop down. Detox Foot Baths... Choosing quality? If you are offering this service it, is up to you to decide what you want in your business. We offer both the high quality (we highly recommended this) brand, built in the USA, which is considerably more expensive and we offer the cheaper units built in China that have the much inferior array. These Aqua Vida units are vastly superior to the cheaper models. You will not just see a water that has turned a rust color. You will commonly see a foaming particulate sludge resulting from this powerful detox system. This is an integrated system, which simply means that the array plugs right into the exterior of the bath. Aqua vida computerized quality controlled array. This array uses self contained technology which controls consistency of amperage and limits sessions in accordance with efficacy. The stainless steel coil and the array itself are vastly superior to just about anything we have seen. Note: You will not see as much result with these cheaper systems as with the USA built AquaVida system. plugs right into the exterior of the bath. 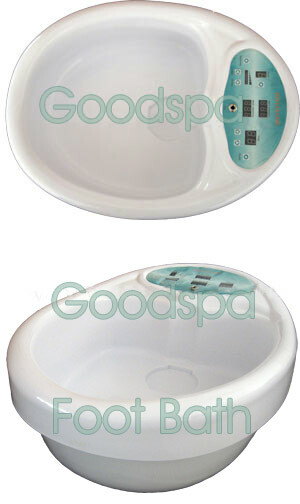 Dual System with MP3 Foot Spa Includes 2 arrays. plug right into this dual control station. This array syncronizes with the digital technology in the controls of the integrated foot bath or dual control system for consistency of amperage and allows fifty sessions. Quality stainless coils. Why do you need to rebalance your body? The body needs to cleanse itself of toxins each day. Toxins the body cannot eliminate are stored in fatty tissue, joints, muscles, and the brain. These toxins can clog cell membrane walls which are then unable to absorb enough nutrition to support normal cell functioning. Over time, this leads to reduced vitality and weakened immune and lymphatic systems. You can see this visually on pH strips as toxins tend to be acidic and reduce the pH balance. The AquaVida foot spa helps the body rebalance itself, improve pH, and increase energy levels. How do toxins build up? There are 500,000 different chemicals used to make, lubricate, clean, coat, wrap, and finish the products we use. Each year over 5,000 new chemical substances are invented. And while our bodies have complex systems that remove toxins, namely the lymphatic, skin, liver and kidneys, they are no match for this onslaught. Heavy metals, minerals, synthetic chemicals and hormones, even human and animal wastes are in the water we drink, the foods we eat, the clothes we wear, the houses we live in, the air we breathe, and the cosmetics we use. Cosmetics are currently below the radar when it comes to identifying toxins. TEA (triethanolamine), DEA (diethanolamine), and MEA (monoethanolamine) are commonly used in cosmetics in the USA. Their use is restricted in Europe as they are known carcinogens. Almost 50% of cosmetics containing ethoxylated surfactants were found to contain dioxane, a carcinogen. Most shampoos contain Sodium or Ammonium Lauryl Sulfate, which caused eye damage, central nervous system depression, and even death to animals that were exposed to it. The skin is the largest organ in our body and because it is permeable it easily absorbs toxins. The scalp is especially permeable to toxins. Consider the numbers of toxic chemicals put in your hair to color or bleach, shampoo, condition, and treat it. Our bodies are bombarded by toxins. In 1999 a noted author and activist, had his blood tested for 150 different commonly used chemicals. His blood had 84 synthetic compounds, including 13 different Dioxins, 31 different PCB's, DDT, lead, organochlorine pesticides, chlorine, and malathion, etc. What waste products are expelled by the sweat glands in the feet? Eccrine sweat is composed primarily of water with various salts and organic compounds in solution. It is a filtrate of plasma, a colorless hypotonic solution that includes sodium, chloride, potassium, urea, bicarbonate, ammonia, uric acid, phosphorus, fatty acids, and other metabolic wastes. We offer day spa equipment and mineral body wrap training, day spa supplies, inch loss body wrap training, we also offer permanent cosmetics video, permanent cosmetics training, body wrap supplies and body wrap video, we are a permanent makeup school.